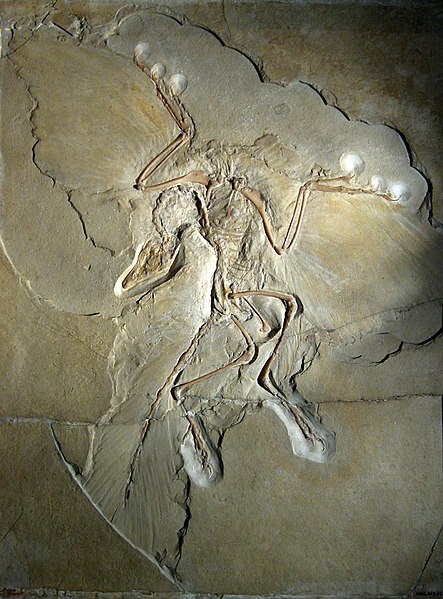 The archaeopteryx was long considered to be the transitional form the between reptiles and birds—the evolutionary link between non-avian dinosaurs and birds. First discovered in 1861 immediately after the publication of Darwin’s On the Origin of Species, this ancient species—about 150 million years old—had teeth, a flat sternum, a long, bony tail, gastralia, and three claws on each wing, characteristics no modern birds has. However, the archaeopteryx also had feathers, wings, furcula, and reduced fingers—all characteristics shared with modern birds. These characteristics, shared fairly evenly amongst non-avian dinosaurs and modern birds, led many scientists, even to this day, to believe that the archaeopteryx was the “missing link” between reptiles and birds. However, the discovery of a recent Xiaotingia zhengi fossil – thought to be closely related to the archaeopteryx – in Western China casts doubt on whether or not the archaeopteryx is even a bird. A team from the Institute of Vertebrate Paleontology and Paleoanthropology asserts that the Xiaotingia, and thus the archaeopteryx, are more closely related to Velociraptors and Microraptors than they are birds. The most compelling evidence for this theory is shallow snouts and expanded regions behind their eye sockets – meaning the skulls of the archaeopteryx and Xiaotingia are more similar to those of dinosaurs than of birds. Despite the controversy over whether or not the archaeopteryx was the “first bird,” analysis of the brain of the creature suggests that it could, in fact, fly. The brain of the archaeopteryx is very similar to the brains of modern birds. In particular, the areas of the brain associated with movement and vision are enhanced, most likely meaning that the archaeopteryx was a visually-oriented animal. Also, their brains were larger than those of reptiles of similar sizes but smaller than brains of modern birds. Recent studies have also linked the size and shape of ear canals to behavior and mode of life. This finding is important to the archaeopteryx because its ear canals are of similar architecture to those of modern birds, giving further evidence to the hypothesis that the archaeopteryx could fly. Another matter concerning the potential flight of the archaeopteryx is its feathers. While it is clear from fossil records that the archaeopteryx had feathers, the purpose of these feathers is not clear. The feathers may not have initially been used for flight. Instead, it has been suggested that the feathers initially evolved for insulation, then were later adapted for flight. However, a color analysis of an archaeopteryx specimen using scanning electron microscopy technology and energy-dispersive X-ray analysis revealed the structure of melanosomes in the single-feather specimen described in 1861. 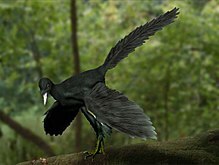 Comparing this structure to that of modern birds revealed the archaeopteryx most likely had black feathers. These black melanosomes have structural properties that strengthen feathers for flight, furthering strengthening the argument that the archaeopteryx could fly. Even if the archaeopteryx could, in fact, fly, it is probable that the archaeopteryx could not fly well. The relatively flat sternum of the archaeopteryx – as opposed to the more rounded sternum of modern birds – suggest that the archaeopteryx lacked some of the more powerful flight muscles of modern birds. Although this does not mean that the archaeopteryx could not sustain flight, it is more likely that the archaeopteryx was a weak flyer. As a result, the archaeopteryx probably used a combination of running, leaping, gliding, and flapping in order to achieve some type of basic flight. Normally, only the hard parts of an animal – bone, teeth, shell – are preserved in fossil records. However, many of the archaeopteryx’s eleven fossil records have been found in the Jurassic Solnhofen Limestone of Southern Germany. As a result, these fossils have been so well-preserved that even some of the softer tissues were preserved. It is because the specimens, few as they may be, are so well-preserved that scientists have been able to so accurately describe the anatomy, behavior, and flight of the archaeopteryx. I really like your post, “cmj94”, and I can never get tired of learning about Archaeopterix.